Jones was drafted in the seventh round, 141st overall, of the 1988 NHL Entry Draft by the Washington Capitals. He played his college hockey at Western Michigan University, and professionally for the Capitals, Colorado Avalanche and Philadelphia Flyers. He played in 491 NHL games, scoring 117 goals and assisting on 141 others for a total of 258 points. Beginning with the 2005–2006 NHL season, Jones has worked as an in-studio TV analyst alongside Bill Clement for The NHL on NBC (formerly The NHL on Versus). 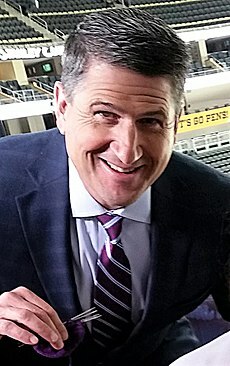 In addition to his duties at NBCSN, Jones also works for NBC Sports Philadelphia as a color commentator and analyst for the Flyers. In addition, he co-hosts a sports talk show with Al Morganti, Angelo Cataldi and Rhea Hughes on 94 WIP Monday through Friday mornings, and he appears frequently on TSN as an NHL analyst. In 2007, Jones, along with ESPN SportsCenter anchorman John Buccigross, wrote his autobiography Jonesy: Put Your Head Down and Skate. Along with a foreword by Ray Bourque, the book recounts many of the stories that Jones witnessed throughout his career. Jones is a resident of Shamong Township, New Jersey. ^ Leakan, Paul. "Reeve Paralysis Foundation cause hits home Med. Lakes family to host fund-raiser", Burlington County Times, March 6, 2005. Retrieved February 4, 2013. "Dana Reeve, country-music star Kenny Rogers, Philadelphia Eagles offensive tackle Jon Runyan, who lives in Mount Laurel, and former Philadelphia Flyers right-winger Keith Jones, a resident of Shamong, are among those scheduled to attend, Miles said." This page was last edited on 25 March 2019, at 02:45 (UTC).